Reports came in Sunday about a suspected arsonist arrested for setting a 5-acre fire. The fires in the Los Angeles/Ventura County area are creating trying times for all of us-but these elements are also bringing out some people who would like nothing more than to see the fire situation worsen. With one arrest, there could possibly be more people bent on destruction. Please keep an eye out for these events and if you see something-please SAY something to the local authorities. If we can stop more potential arsonists from creating more damage, we can allow our incredible fire fighters the time and resources to tackle the already existing fires. If you SEE something -please SAY something. Kristing Rayder (Left) of the Scripps Ranch Fire Safe Council Board accepts the check from Rick Aschenbrenner of The Glen at Scripps Ranch. The Cedar Fire’s 15th anniversary reminds San Diego about the importance of fire safety and preparedness. 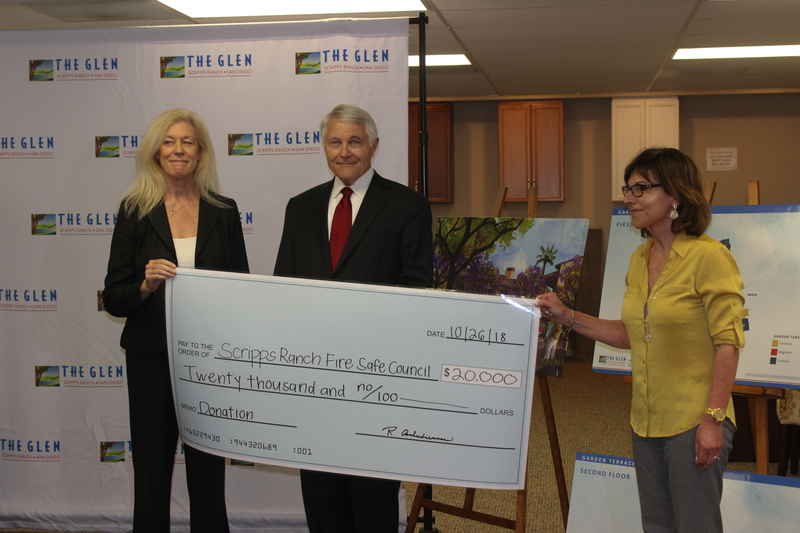 The Glen at Scripps Ranch made a $20,000 donation to the Scripps Ranch Fire Safe Council to help provide 10 special fire equipment boxes to be place strategically around the Scripps Ranch fire district for first responders in the event of wildfires to help citizens evacuate the area. Equipment includes emergency vests, traffic cones and signs, flare, etc. 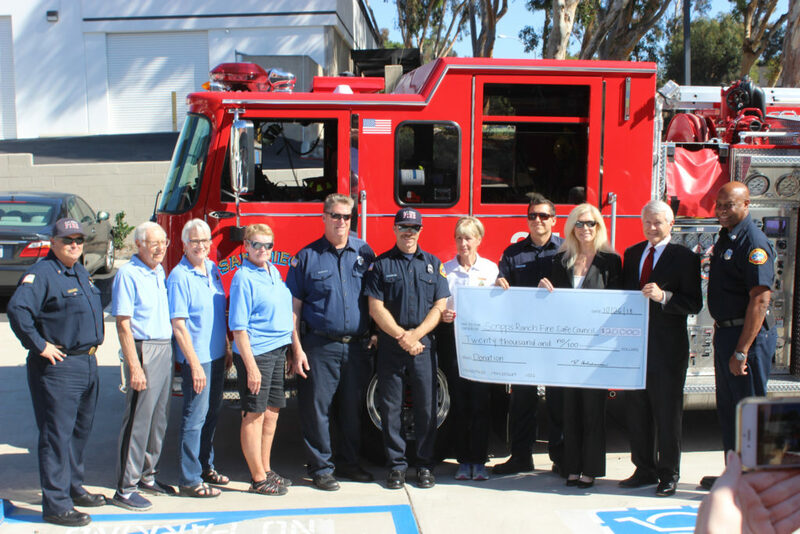 On hand for the check presentation were Captian Bowns (Engine 37) and crew, and Sandy Wetzel Smith, Jerry Mitchell, Karen Herreros and Kristi Rayder from Scripps Ranch Fire Safe Council. 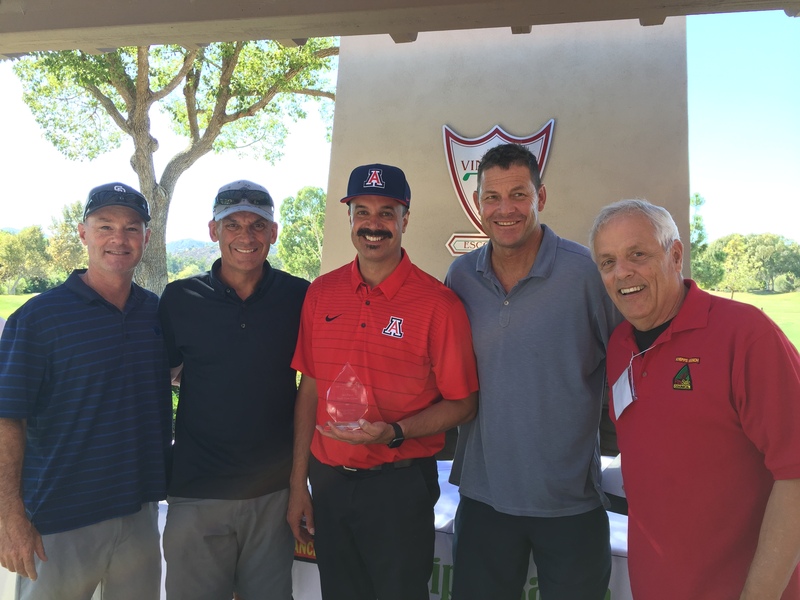 San Diego Fire Chief Colin Stowell (Left) and his Deputy Chief Jim Wood joined dozens of golfers on October 20th for the 12th Annual Scripps Ranch Fire Safe Council “Play to Protect” golf tournament. The event, at The Vineyard in Escondido was held to raise funds to educate and inform the public about the dangers of wild fires in San Diego. 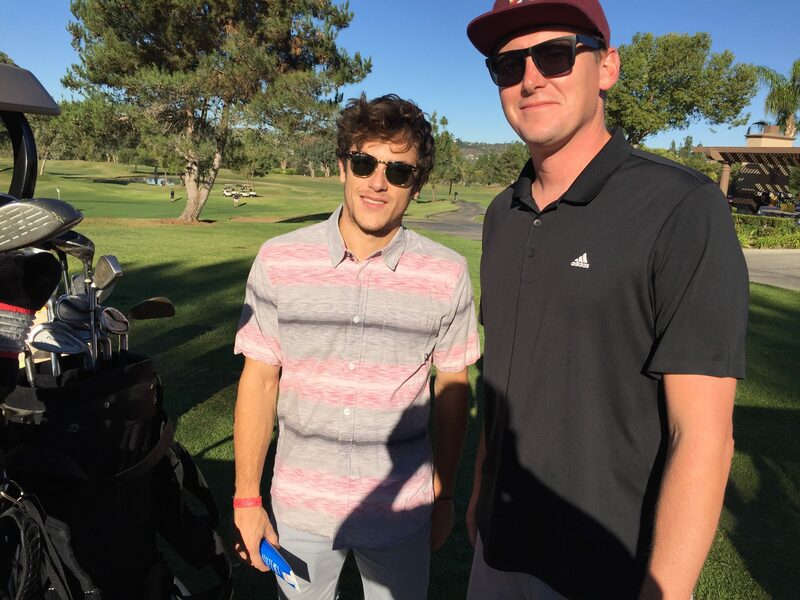 Pictured here are golfers Nick Bennett and Adam Rosati representing Local Blitz Marketing. Thousands of wildfires strike California each year. Prepare your family, home and property in advance of a fire with CAL FIRE’s Ready, Set, GO! guide. 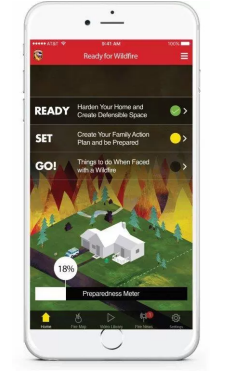 This includes easy-to-follow checklists for maintaining Defensible Space, hardening your home, creating a wildfire action plan, assembling an emergency supply kit, and evacuation information. Also, get signed-up custom wildfire alerts when an incident is reported in your area. Questions? Comments? Concerns about wildfires in Scripps Ranch and San Diego? Drop us a note. “The Scripps Ranch Fire Safe Council was organized to protect our residents, their homes, communities and environment from wildfires”. 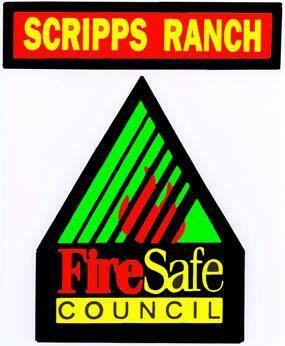 The Scripps Ranch Fire Safe Council started as The Chimney Canyon Fire Safe Council,established following the devastating Cedar wildfire that swept into San Diego on October 26, 2003. 312 homes were destroyed in Scripps Ranch. We were extremely fortunate. Firefighters stopped the fire within 70 feet of entering our canyon. The name Chimney Canyon came from a local fireman who, three days after the fire, told us that had the fire entered our canyon 200 more homes would likely have been destroyed. What is a Fire Safe Council? “The Scripps Ranch Fire Safe Council exists to protect the people of our community and their property from the effects of catastrophic wildfire through education, cooperation, innovation and action. Wildfires in San Diego are serious business, but we don’t want to miss out on the chance to have a little fun. The Scripps Ranch Fire Safe Council is sponsoring our 11th Annual Golf Tournament at The Vineyard in Escondido. Click HERE for more information, and sign up now.